Remember that one time that your shoulder was covered in your baby’s spit-up and you’d been up at 1 am and 5 am and hadn’t gotten a chance to shower, and then your spouse came home from work and you got all dressed up and shared a romantic candlelight gourmet dinner with wine in front of the fireplace? HA! HA! Yeah, me either. (The last part anyway.) 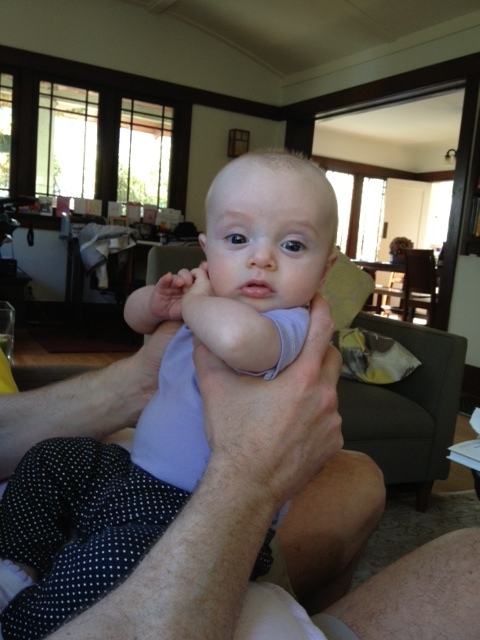 My relationship with Hubs has actually been deepened and strengthened by the arrival of Lucy. We adore her so much and even though we were definitely in love before Lucy, I think we have a whole new level of love and respect for each other now. I am also making a concerted effort to avoid getting snippy with Hubs even when sleep deprivation might otherwise encourage me to do so, so we are bickering much less and I feel like we’ve been working as a very good team. However, while Lucy has added to our relationship in the love department, I can’t exactly say the same about the romance department. (Conversations about dirty diapers? Hot!) As I wrote earlier, for a long time I was hesitant to be without Lucy very often, even when she’s in the capable hands of her Nana and Papa. When we went out to Hubs’ holiday party, I was checking my phone obsessively and we only lasted a couple of hours before we raced home to check on her. We have a great deal of fun together at home with Lucy, but it does make for a lot of interrupted conversations and meals. This week I decided I was finally ready to reinstate our weekly Friday night date night. And I found myself getting genuinely excited about an adult night out. Last night rolled around and I was happy to find I was still excited. I got myself dolled up (ok, put a cute skirt and boots on over my leggings, some mascara and a ponytail — hey, it’s something, don’t judge! ), we kissed Lucy goodbye and headed out. And then when we got home, we got to spend some more time with Lucy. Ok, I cheated — this photo was taken this morning, but I couldn’t resist. I’m pretty sure this is what they call a win-win.